Master of Management (Accounting) students take on SAP software, supermarkets and muesli in the 2017 ERPism Asia Pacific Japan Cup. What cereal are you going to eat this week? 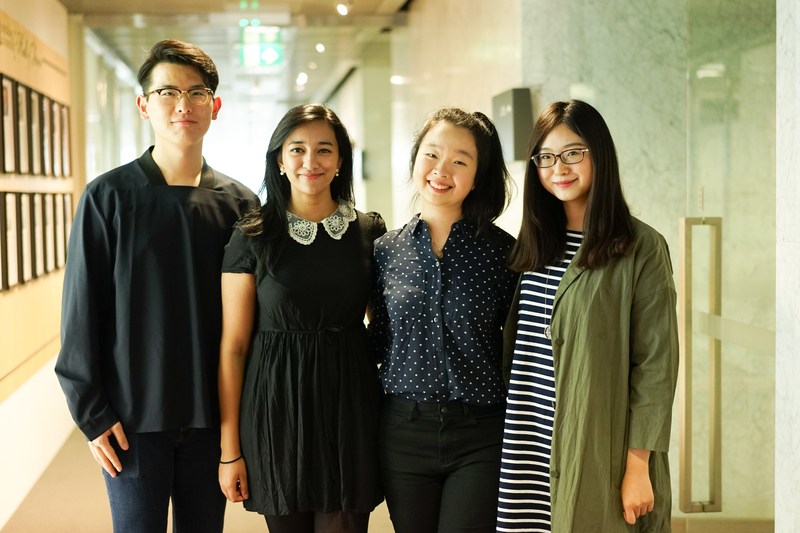 It seems like an unlikely question for Accounting students to tackle but on March 15, Master of Management (Accounting) students Jenny Jacob, Gilbert Han, Maggie Singorahardjo and Sherry Yao, not only took on this task but came out successful, coming third in the ERPism Asia Pacific Japan Cup. The task: Compete against other university student teams each operating a ‘Muesli firm’ in a simulated game using the Enterprise Resource Planning (ERP) software, SAP. The challenge: The group had never used SAP software before being invited to compete, had never worked together as a group, and had only five working days to get a handle on both before the competition. By introducing a student version of SAP software in the degree’s Information Processes and Controls subject this year, Dyki filled this gap and received an invitation for the University of Melbourne to compete in the competition. Watching the students in a practice run against the University of the Philippines, the focus of the group is intense, but while they are essentially applying their accounting knowledge in a software simulation, it is obvious that teamwork and strong communication is the key to their success or failure. They form pairs: Yao and Singorahardjo on production, and Jacob and Han on marketing and sales. “How much do you want to forecast for?” Han asks. “The raw materials for the blueberry muesli are really high, as they are for the strawberry, but they are popular with the market”, Yao returns. At the end of round one of the practice, they take stock. “We should have outsold them but they outsold us,” says Jacob a little surprised. “We’ve run out of blueberry but we’ve got strawberry and raisin still in stock,” offers Singorahardjo. Still on a high from their third-place win for the Asia Pacific Cup we catch up with the team about the competition and their next steps. Why were you interested in being part of the Cup? Jacob: My undergraduate majors were marketing and finance, but during my Masters I was really struggling to see how these fields could possibly work in concert, so I was genuinely curious to see how they could be integrated along with accounting successfully in the simulation. Han: I completed an internship at the Agricultural Bank of China in Shanghai during my undergraduate degree, where I was exposed to the idea of ERP, but their SAP-by design system was restricted to staff, so I wanted to see how it would work. Plus I really like the idea of ‘learning-by-doing’; I thought it would really help me see how the whole business process really worked. What were the main challenges you faced during the competition? Singorahardjo: I think it was making sure we worked well together as a team. At first, we were all very confused as to what we were supposed to be doing, and felt we lacked strategy and coordination. On the day, I was so nervous but also excited to be representing Melbourne Business School. I was just hoping we didn’t place last! Yao: Exactly, plus we’d never used SAP before. At the end of our first trial, the company value was about minus several million! But with practice, we improved. Maggie and I figured out an appropriate purchasing strategy to balance the trade-off between sufficient stock and minimum extra storage expense. Han: For Jenny and I, the main difficulty was about taking charge of the pricing and marketing process within the quick time-frame, just 20 minutes per round and 4 rounds in total. We had to carry out analysis at the first stage, varying prices to figure out the best-selling products, plus try to identify how our competitors were performing. You are all in your final semester of the Master of Management (Accounting). How has the competition helped you prepare for grad roles? Yao: Participating in the Cup will definitely help me with my applications for grad roles. I think we all now have a much better understanding of the inner-workings of what accountants contribute to an organisation and it will be a great experience to discuss in interviews. Jacob: The experience has taught me more about efficient teamwork than any number of group assignments could! Congratulations to the Melbourne Business School team who will be joining the group from University of Indonesia, reigning Asia Pacific champions and 2017 winners, who will be going to the world competition later this year.